This picture has been circulating the internet and so I had to do some fact checking to see if someone took some liberties with Photoshop, as we've so often seen. As it turns out, this is straight up legit! 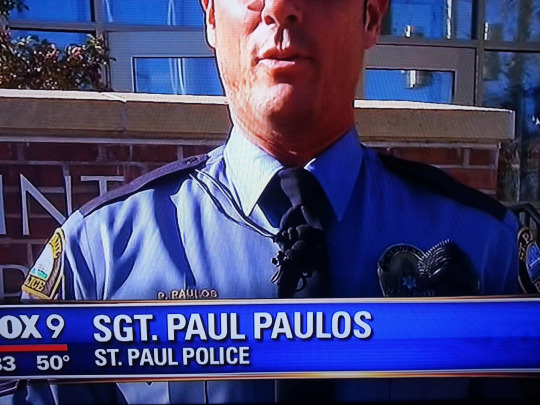 Sergeant Paul Paulos is a real person that works for the Saint Paul police department. In fact, he's a pretty popular dude, as he's got more than 500 connections on LinkedIn. It appears that his job mostly revolves around working in public relations and relaying information to the media. Want to see some local news stories that Paul Paulos has been involved in? You can find a bunch on the Minnesota CBS affiliate here. If you're just looking for some clever Paul related puns and jokes, well, you can find those on imgur here. Keep up the good work Paul Paulos of Saint Paul Paulice Depaulment! I couldn't help myself.... I apologize. Here's a video of Paul talking about his role in communications and GovDelivery.